Ajax TOCCO is pleased to announce the introduction of the FECO product line to its family of thermal processing systems. FECO has been a world leader in the metal decorating arena for many decades, producing Pin Ovens and Internal Bake Ovens (IBO), Cap Cure, Wicket Ovens, and Container Handling Equipment used to process Aluminum and Steel Containers for the Beverage, and Food Industries. 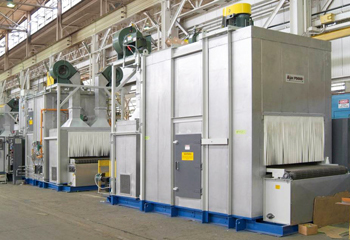 FECO products have served the Foundry Industry for over 85-Years supplying Core/Mold Wash Drying Ovens as well as custom designed and manufactured batch and continuous oven systems for tempering, annealing, aging, solution heat treating, preheating, and other heat processing operations. Full ranges of heating systems are available providing operating temperatures up to 1400º F with a comprehensive range of options, including many innovative conveying systems. To satisfy growing environmental awareness, more manufacturers are replacing conventional plating/coating processes with alternative coating solutions that provide comparable or improved corrosion resistance along with improved recyclability, and reduced environmental impact. The FECO procduct line works with many types of color coatings, barrier coatings, varnishes, plastisol, zinc-rich coatings, foundry core washes, and others, offering fluid bed, flow-coating, dip, dip-spin, dacroment, powder and spray systems, as well as a unique and cost effective method of applying barrier coatings to plastic and glass containers. Whether your products are small bulk fasteners or large discrete parts, Ajax TOCCO has the products and expertise to integrate an optimum oven system.